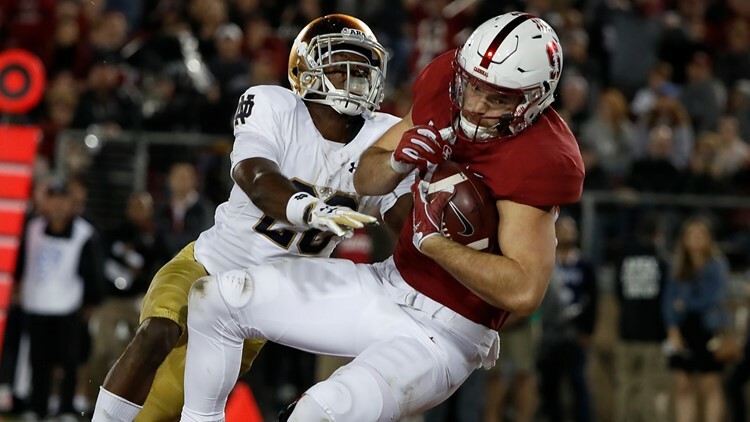 The Cowboys had trouble filling Jason Witten’s shoes throughout the 2018 season which means they could be in the market for a tight end in the upcoming draft such as Stanford’s Kaden Smith. The Dallas Cowboys will likely look to address either the wide receiver or tight end position in the upcoming NFL Draft. The team has made a concerted effort to get younger at each position and especially at tight end after the departure of Jason Witten last April. Geoff Swaim is the only tight end who has a deal expiring following the end of the 2018-19 NFL season. Blake Jarwin and Dalton Schultz were the receiving options for most of the second half of the season while Rico Gathers was mainly used as a decoy in blocking situations once Swaim was placed on the injured reserve list with his injury. One name to consider starting on day two of the NFL Draft is Stanford Cardinals’ Kaden Smith, who played along side Schultz in Palo Alto. Smith is a local talent who spent his high school days in Flower Mound, Texas. In addition, Smith is a big-bodied tight end who was asked to be both a receiving option and a blocker in the usual Stanford mold. In the Stanford offense, the Cardinal are traditionally heavy on the run so it should come as no surprise that Smith was asked to hone his blocking acumen. He can struggle against defensive ends if he doesn’t have proper footwork but he showed himself to be an able blocker in the offense and time learning at the professional level should only increase those abilities. Similarly, something the Cowboys would want to see, as they are also a run-heavy team, is a commitment to blocking. The Cowboys were blessed for over a decade to have a tight end in Witten who could do it all. Whoever ends up taking the majority of the snaps at TE in Dallas will need to be able to block effectively. Smith maintains his blocks through the whistle. There is no questioning his effort in this part of his game. Smith shows the ability to chip on defenders and get into his route quickly. He will line up at the h-back, inline or in the slot. Smith will need to work on his lower body strength in order to be able to drive block at the next level, however. As a pass catcher, Smith showed good hands at the collegiate level. He showed a knack for catching the ball in traffic but seems to have the occasional drop due to lack of focus. It doesn’t seem to be an issue with hands as much as dealing chaos around him during contested catches. He will make more contested catches than he will drop given the opportunities, however. With the ball in his hands, Smith shows good field awareness. He knows where the sticks are and makes the extra effort to secure a new set of downs for the offense. The former Cardinal isn’t explosive as a route runner, but he does create space with his body control. He is able to shield defenders with his frame. Smith can win up the seam, which is something that was lacking for most of the season for the Cowboys. It wasn’t until the final game against New York, that the Cowboys were able to take advantage of the seam using the tight end when Blake Jarwin busted out for a three-score day. Smith is another tight end who has the potential to do that on a more consistent basis. It might be the fact that he wore number 82 in college, but his game is mildly reminiscent of Witten’s in that he’s both a run blocker and pass catcher who looks like he could become a security blanket for his QB and a guy who is counted on to move the chains or open up a running lane. Kaden Smith should be one of the better options at a position they might be looking to improve at when the Cowboys finally come to the podium on day two of the NFL Draft. Do you think that the Cowboys have found their tight end of the future in Blake Jarwin or should they continue looking for Jason Witten’s replacement in the draft? Share your thoughts with Patrick on Twitter @DraftCowboys.